Love the colors in this. We are in the midst of remodeling our bathroom in the our new house. This will look amazing on the antique vanity we bought. Colors are as they appear in the picture and the bowl is a nice quality. Very happy with our purchase and can't wait until our bathroom is finished so we can show it off. You never know...had shopped all over looking for the statement piece (vessel sink). I decided to check out Overstock website, and found what I thought would be the perfect fit for our remodel bathroom project. I was thrilled, as the vessel sink shipped in a timely fashion. I can't tell you how thrilled I was when I opened the box to find a beautiful statement piece! I have been excited to show it off to family and friends! I will be even more thrilled when the remodel is complete!! I LOVE this sink... and so does everyone who enters my house! This is in my front powder bathroom and it is absolutely stunning. Beautiful sink and glass is thick, have looked at others that looked to easy to break, but this one is strong and came in good packing. Need to buy the stopper and faucet separate. Beautiful vessel! I love the colors! It is in my remodeled bathroom and is a real show piece. Often times guest will remark on what lovely sinks we have. They love the pop of color against our white subway tile. 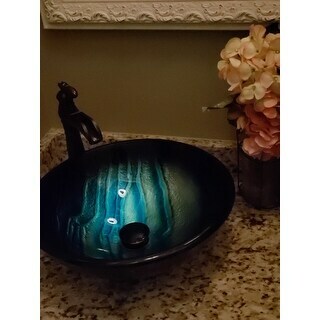 Bought two sinks paired with chrome LED waterfall facets to compliment the vanity style. Very sleek, yet... seemingly grand sitting on the white stone counter tops. Beautiful colors and thick glass. Love my vessel sink! Wish it had stopper instead of just strainer. Beautiful and perfect in everyday. Stays clean looking, and get tons of compliments! !-the guys who installed the quartz counter top wanted to take it home with him! Absolutely beautiful colors: ocean blues, turquoise, pearly white and silver. Large bowls, very impressive. This is a nice heavy sink. That is all that I can say good about it. The color is nothing like the photo. There are stripes of very bright turquoise, It looks like a child smeared some paint on, the paint settled into cracks and lines. There is no continuous color just a few stripes. Returned it. Awful...would not recommend. Darker then expected, actually is black around the rim. Well made, sturdy. Yhe picture shows a sapphire blue but the sinks are predominately turquoise. I needed blue. 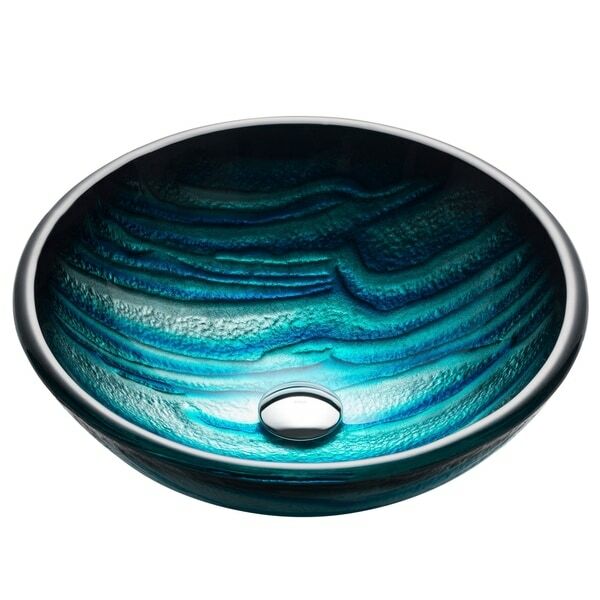 This is a large, deep basin with colors that remind me of seawater, ranging from green to deep blue. It appears to be very well-made and should stand up well. This is STUNNING and I have quartz that looks like marble with it for a powder bathroom. Love it! Beautiful glass bowl! Even prettier than picture! Everyone always comments on how much they like it along with the waterfall faucet. "Does this come with a drain stopper?" Hello Chasman, I hope your day is going well. This does not include a drain stopper. Thank you for shopping with us.